Of course, I already have two of those but the first one, in blue cotton sweat shirting has stretched and shrunk out of shape quite a bit after repeated wear and washing. The other one is just a bit too warm for most of the places I go to for climbing. In this case, I decided not to go for the same pattern all over again. The old one had open pockets and turned out just a tiny bit short. So, this one has zippered pockets and is longer. It also has raglan sleeves. The fabric is a peculiar, fairly heavy, mystery fibre knit which really looked like sportswear material. 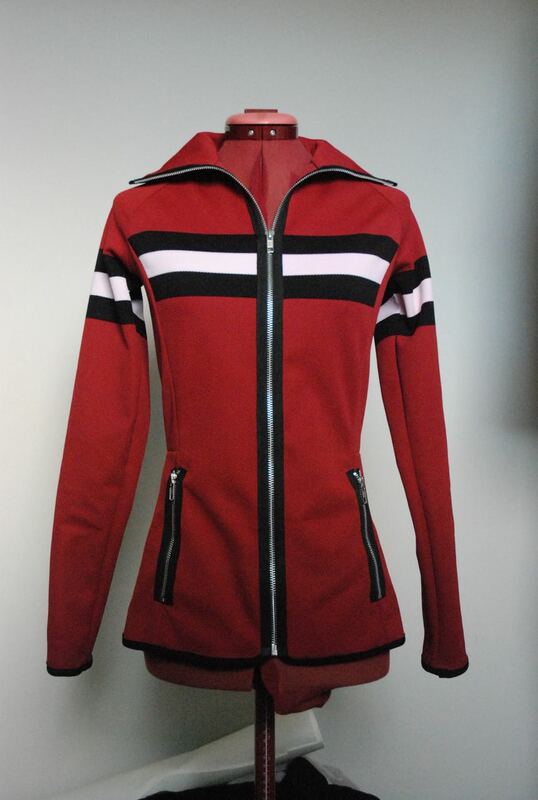 I found it on sale (only in this colour) and liked the stripes. It is almost like a panel print: there are about 70 cm of burgundy red between each set of stripes. I used sportswear lining for the insides of the pockets and finished all the edges with fold-over elastic. 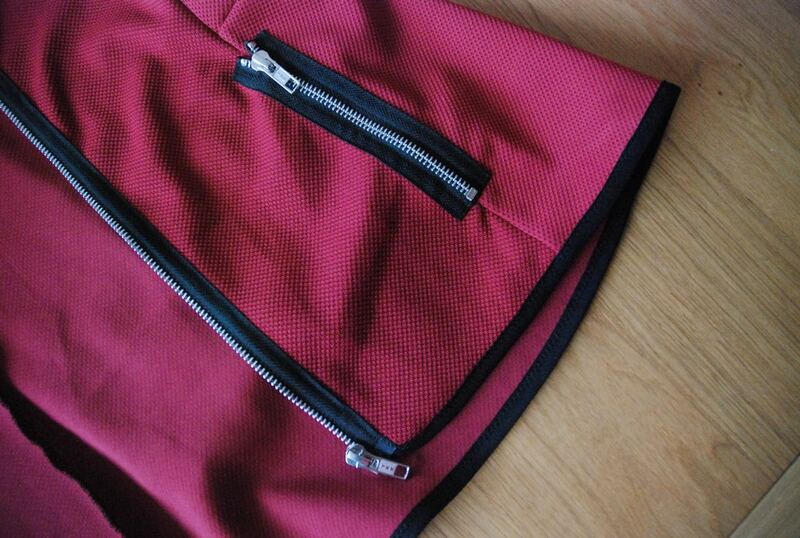 I am particularly proud of the way that worked for the main zipper. 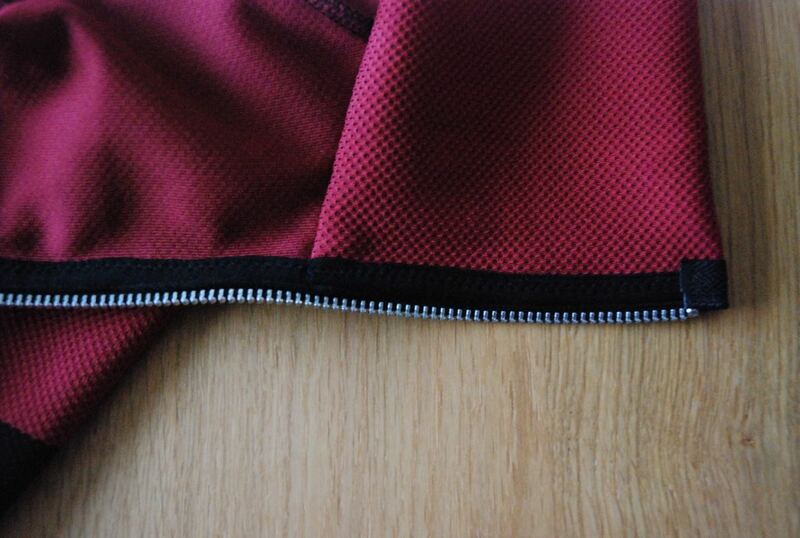 This is the inside of the jacket where all the stitching is on the black elastic, making it look very clean. For the pockets, I basically made in-seam pockets and sewed on the zippers over the openings. I am surprised at the retro-y look of the jacket. I wasn't particularly going for that but I like it. I'll have to wear it out to the climbing hall a couple of times to be able to tell you how well it does the job it was made for. Love the fold-over elastic idea. I am about to start making a similar jacket and never thught about fold-over elastic so thank you for that. Very helpful. And I love the jacket too! That's amazing! I love all of the details and it's so well sewn.